We have several lending options for our members who need to borrow money. We have competitive rates, and we are easy to work with, It's also easy to pay your loan payment each month. We offer payroll deduction, which is an automatic deduction from your payroll check that comes directly to the credit union and pays your loan payment (or deposits money into your savings account). You can also pay your loan payment by allowing us to debit your account at another financial institution. 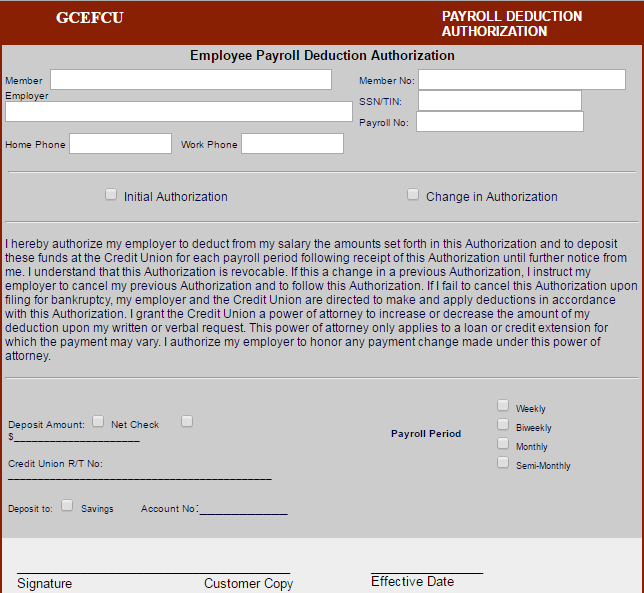 **Print the payroll deduction form, fill it out, and return to our office in person or via fax or email. With a GCEFCU Share Secured Loan, your savings deposits in the credit union serves as collateral to secure your loan. It is a perfect way to borrow money and still keep your savings intact and earning interest for YOU! These loans have one of the lowest available interest rates that we offer. The interest rate on these loans is only 3%APR above the dividend rate declared and paid on your current savings balance from the previous quarter for the year. Terms on the loan are flexible. After each loan payment is made, the secured amount from your savings reduces and becomes available to you by the amount of principle that was paid towards the loan. Best of all, the secured, pledged savings amount is earning interest for you over the life of the loan. Take advantage of a lower interest rate and keep your savings by making it work for you. A Signature Loan is an unsecured loan with no collateral. These types of loans are ideal to help meet the unexpected expenses of medical bills, car repairs, home repairs, vacations or other needs. The amount that you may be eligible to apply for is based on many factors such as credit score, length of employment, unsecured debt ratio, etc. You must be a member of the credit union for three (3) months before you are eligible to apply for a signature loan. GCEFCU offers low, competitive interest rates and convenient terms on all new and used vehicle loans. We make buying a car a pleasant experience for our members. Pre-Qualifying for an auto loan is the first step members need to take so they can go shopping for that car with a loan already in their hands. This gives them the buying power and assurance needed to face those giant car dealers and make the best deal possible. GCEFCU can match or possibly offer lower interest rates than the car dealer. Check with the credit union first before shopping. By consulting a loan officer at the credit union, you will be given the guidance and information needed in order to make your next vehicle purchase easier, more informed and save hundreds of dollars. If you have already purchased a vehicle, you can still take advantage of GCEFCU's great member service by refinancing and getting a matching or lower interest rate and payments. We will be closed when HSSD is closed for weather.